Field Representative Kirby Brandenburg, from the office of U.S. Rep. Jim Jordan, R-Urbana, 4th District, presents Vietnam veteran Leroy Baker with The Army Commendation Medal at the home of Baker’s daughter, Tami, on Monday, April 1. 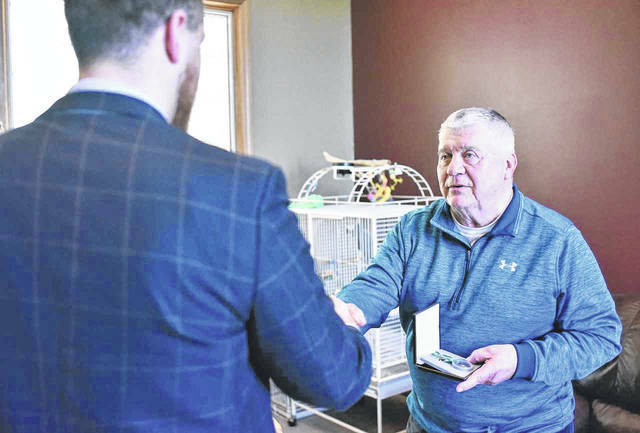 Vietnam veteran Leroy Baker, 75, of Sidney, was promised The Army Commendation Medal over 50 years ago, in 1968, following his return from serving in the Vietnam War. 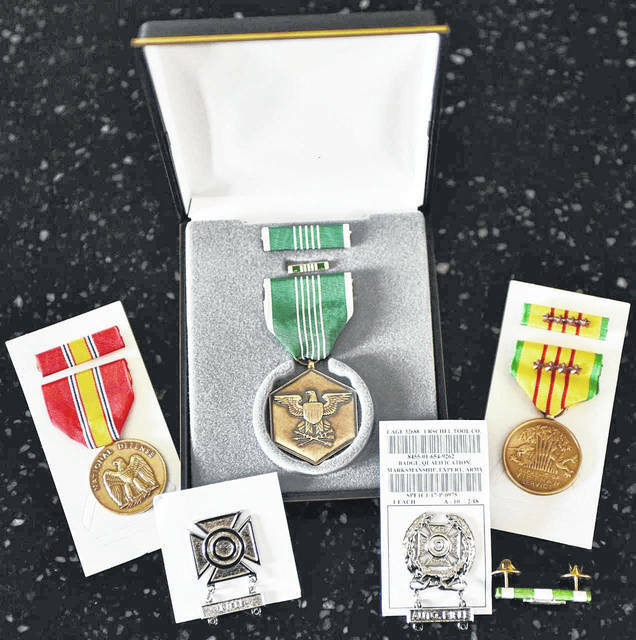 Baker also received the National Defense Service Medal, the Vietnam Service Medal, the Republic of Vietnam Campaign Ribbon, an Expert Badge with Auto Rifle Bar, and a Sharpshooter Badge with Rifle Bar, Monday. SIDNEY — Sidney resident Leroy Baker was presented with The Army Commendation Medal, along with other service awards, Monday, April 1, by a representative from the office of U.S. Rep. Jim Jordan, R-Urbana, 4th District. The Vietnam veteran was promised the medal over 50 years ago, in 1968, but never received it. “Mr. Baker, it’s definitely an honor to come here and represent Congressman Jordan’s office and be able to help you get these medals,” said Field Representative Kirby Brandenburg. The presentation took place at the home of Baker’s daughter, Tami DeMoss, of Sidney. “The Army Commendation Medal is awarded to any member of the armed forces of the United States, other than general officers, who, while serving in any capacity with the Army after Dec 6, 1941, distinguished himself by heroism, meritorious achievement, or meritorious service,” Brandenburg said. It was a segment in the Oct. 6, 2018 edition of the Sidney Daily News that reminded Baker he had yet to receive the medal. According to DeMoss, Baker shared the article with her husband, Jeff, who then took it upon himself to contact Jordan’s office. From then on, Baker said, a representative from Jordan’s office was in regular contact with him while working on locating the medal and getting it to him. Though it is not exactly clear why the medal never made it to him back in 1968, Baker attributes it to the time period, which has come to be known as quite a tumultuous period in history. “A lot of things went under the sleeve back then,” Baker said. Having been drafted into the Army at the age of 23, Baker went through basic training before completing advanced individual training in Fort Sill, Oklahoma. “I was a clerk for the lieutenant colonel there on that post for about four or five months, then I got shipped to Vietnam and I was put out in heavy artillery,” Baker said. Baker said he was never supposed to be drafted into the armed forces due to torn cartilage and knee surgery, but eventually, the military needed members badly enough that his knee issues were no longer disqualifying. Along with The Army Commendation Medal, Brandenburg presented Baker with the National Defense Service Medal, the Vietnam Service Medal, the Republic of Vietnam Campaign Ribbon, an Expert Badge with Auto Rifle Bar, and a Sharpshooter Badge with Rifle Bar.